The paper often presents methods used to measure highly concentrated solar energy fluxes. A comparative analysis of the errors of each of them is made. High-temperature solar installations, like the Big Solar Furnace (BSF) with a thermal power of 1,000kW in Uzbekistan and France, as well as other high-precision paraboloid concentrators, allow receiving concentrated flows with a density of 1000 W/cm2 in the focal zone.1,2 As we know, measuring a powerful stationary stream of concentrated solar energy up to 700 ÷ 1000W/cm2 is quite a challenge (Figure 1). 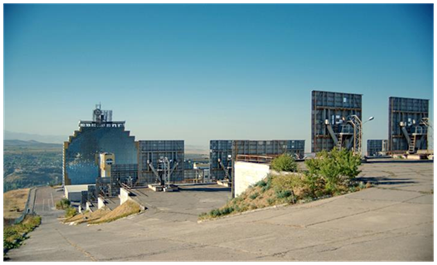 Figure 1Big Solar Furnace with a thermal power of 1,000 kW in Uzbekistan (Parkent). To measure the density of a concentrated flux of solar energy up to 20 W/cm2, the sensors of heat fluxes used in various branches of science and technology are more convenient. For example, a Vatell water-cooled sensor, in which the flow of heat energy is determined from the characteristics of the flow of heated water. Table 1 shows the main characteristics of Thermogage Circular-Foil Heat Flux Transducer of Vatell Corporation. As can be seen from the above data, the total error of the method, in addition to the errors associated with the accuracy of the measuring instruments, is related to the loss of lenses, losses associated with the spectral range (spectral dependence of the degree of blackness), etc. 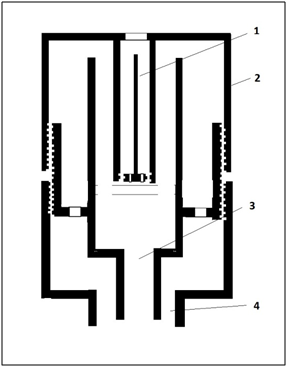 Figure 3 Design of the water-cooled sensor: 1 - sensor element - rod, 2 - sensor housing, 3,4 - water inlet and outlet. Here k is the coefficient of thermal conductivity, S is the cross section, T is the temperature, t is the time, c, is the heat capacity, the density of the material of the rod. A radiometer of this design is used at the Institute of Materials Science of the Scientific and Production Association "Physics-Sun" of the Academy of Sciences of Uzbekistan to measure the density of highly concentrated solar energy fluxes in the focal zone of the BSF. It should be noted that equation (1) is in fact only an approximation, since there are no losses associated with the thermal conductivity and convection of air in the sensor housing, loss through radiation. Obviously, taking these factors into account can eliminate a systematic error in the flow measurements. where F( x,t ) MathType@MTEF@5@5@+= feaagKart1ev2aqatCvAUfeBSjuyZL2yd9gzLbvyNv2CaerbuLwBLn hiov2DGi1BTfMBaeXatLxBI9gBaerbd9wDYLwzYbItLDharqqtubsr 4rNCHbGeaGqkY=gjVeeu0dXdPqFfpec8Eeeu0xXdbba9frFj0=OqFf ea0dXdd9vqaq=JfrVkFHe9pgea0dXdar=Jb9hs0dXdbPYxe9vr0=vr 0=vqpWqaaeaabiGaciaacaqabeaadaqaaqaaaOqaaabaaaaaaaaape GaamOramaabmaapaqaa8qacaWG4bGaaiilaiaadshaaiaawIcacaGL Paaaaaa@3B80@ is the loss function. If we assume that the losses due to thermal conductivity are proportional to the temperature difference between the medium and the rod, heat transfer passes through the element of the rod surface, then F( x,t )=2πR k 1 ( T− T s ), R MathType@MTEF@5@5@+= feaagKart1ev2aqatCvAUfeBSjuyZL2yd9gzLbvyNv2CaerbuLwBLn hiov2DGi1BTfMBaeXatLxBI9gBaerbd9wDYLwzYbItLDharqqtubsr 4rNCHbGeaGqkY=gjVeeu0dXdPqFfpec8Eeeu0xXdbba9frFj0=OqFf ea0dXdd9vqaq=JfrVkFHe9pgea0dXdar=Jb9hs0dXdbPYxe9vr0=vr 0=vqpWqaaeaabiGaciaacaqabeaadaqaaqaaaOqaaabaaaaaaaaape GaamOramaabmaapaqaa8qacaWG4bGaaiilaiaadshaaiaawIcacaGL PaaacqGH9aqpcaaIYaGaeqiWdaNaamOuaiaadUgapaWaaSbaaSqaa8 qacaaIXaaapaqabaGcpeWaaeWaa8aabaWdbiaadsfacqGHsislcaWG ubWdamaaBaaaleaapeGaam4CaaWdaeqaaaGcpeGaayjkaiaawMcaai aacYcacaaMc8UaamOuaaaa@4ABA@ is the radius of the rod. F( x,t )=2πR k 1 ( T− T s ), R MathType@MTEF@5@5@+= feaagKart1ev2aqatCvAUfeBSjuyZL2yd9gzLbvyNv2CaerbuLwBLn hiov2DGi1BTfMBaeXatLxBI9gBaerbd9wDYLwzYbItLDharqqtubsr 4rNCHbGeaGqkY=gjVeeu0dXdPqFfpec8Eeeu0xXdbba9frFj0=OqFf ea0dXdd9vqaq=JfrVkFHe9pgea0dXdar=Jb9hs0dXdbPYxe9vr0=vr 0=vqpWqaaeaabiGaciaacaqabeaadaqaaqaaaOqaaabaaaaaaaaape GaamOramaabmaapaqaa8qacaWG4bGaaiilaiaadshaaiaawIcacaGL PaaacqGH9aqpcaaIYaGaeqiWdaNaamOuaiaadUgapaWaaSbaaSqaa8 qacaaIXaaapaqabaGcpeWaaeWaa8aabaWdbiaadsfacqGHsislcaWG ubWdamaaBaaaleaapeGaam4CaaWdaeqaaaGcpeGaayjkaiaawMcaai aacYcacaaMc8UaamOuaaaa@4ABA@ - the degree of blackness of the web material. As we know, the BSP consists of 62 heliostats that are located on 8 floors. The energy contribution of each floor to the total energy is different. 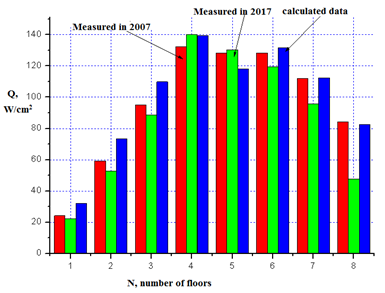 In Figure 4 shows calculated and measured using a radiometer in 2007 and 2017 energy characteristics from heliostats of the individual floors of the BSF. Figure 4 Calculated and measured using a radiometer in 2007 and 2017 energy characteristics from heliostats of the individual floors of the BSF. 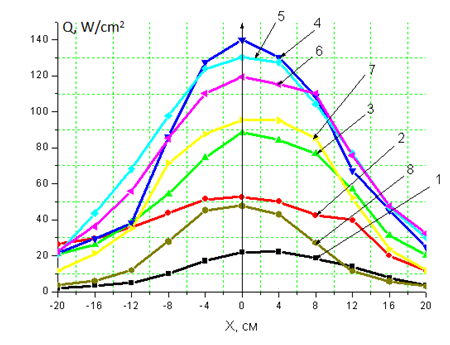 Figure 5 shows the measured values of light flux density distribution in the focal zone for different BSF floors. The data are reduced to a value corresponding to the incident direct solar radiation of 700 W/m2. Q - the light flux in a focal spot of diameter D = 40 cm. Q1 =23,55 кW; Q2 =44,77 кW; Q3 =58,55 кW; Q4=77,09 кW; Q5 =87,72 кW; Q6 =83,02 кW; Q7 =54,29 кW; Q8=18,28 кW. Figure 5 The light flux density distributions from the heliostats of individual floors of the BSF. As can be seen from expressions (5) and (9), when the losses are taken into account through radiation and thermal conductivity, an additional term inversely proportional to the radius of the rod appears. In our opinion, this fact can be used to improve the accuracy of measurements. Carrying out measurements with sensitive elements of different radii made from the same material, we can reduce the measurement errors associated with the degree of blackness of the material. Using the above formulas (4-9), we can form a calibration curve for the transition from mV to W/cm2 for the radiometer used, taking into account the features of the radiometer. Thus, the main advantage of this method is spectral non-selectivity. The small size and mass of the receiving surface in radiometers provide a low inertia and the possibility of obtaining detailed characteristics of the concentration field. 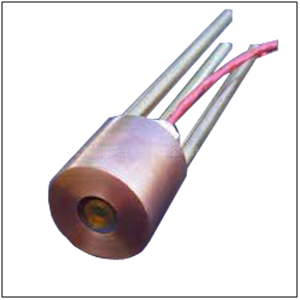 Modern designs of radiometers with cooling of the measuring part allow measuring stably high levels of flux density up to 1.5 • 107 W/m2. My research project was sponsored by Ministry of Innovation of the Republic of Uzbekistan with grant number (ИЗ-20170927404). Azimov SA. Questions of installation and alignment of reflecting surfaces of large solar power plants. Geliotechnika. 1983;6:26−31. Trombe F, Le Phat Vinh A. Thousand KW Solar Furnace, Built by the National Center for Scientific Research in Odeillo (France). Solar Energy. 1973;15(1):57−61. Zakhidov RA, Umarov G Ya, Weiner AA. Theory and calculation of helio-technical concentrating systems. India: Gujarat Energy Development Agency; 1977. 144p. Richard W Treharne, H W Trolander. Wavelength independent, direct reading radiometer. 1968;42(9):1−4. Abdurakhmanov AA. et al. On the errors of diaphragm when measuring fluxes of concentrated solar radiation. Proceedings of the international conference dedicated to the 90th anniversary of Academician SA Azimov. 2004 Nov 18−19; Tashkent, Uzbekistan. p. 95−98. Abdurakhmanov AA, Akbarov RYu, Sobirov Yu, et al. Photometer for measuring the density of concentrated solar radiation. Geliotechnika. 2000;36(2):72−75. Key features of Vatell TG9000, Radiative Water Cooled Radiometer. ©2018 Sobirov et al. This is an open access article distributed under the terms of the Creative Commons Attribution License , which permits unrestricted use, distribution, and build upon your work non-commercially.